A mountain stage? This stage features a very tough late climb and puts a premium on descending skills. 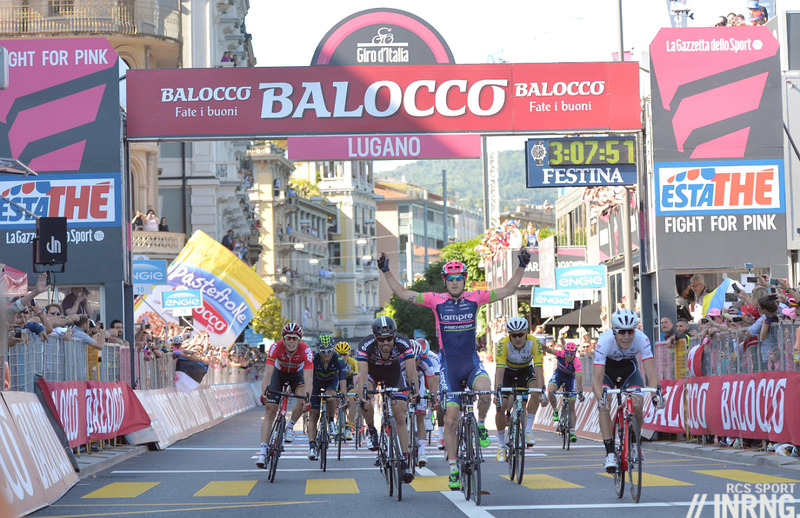 Stage 17 Wrap: a three rider breakaway went with a rider from Nippo-Vini Fantini, Androni and Etixx-Quickstep. Spot the odd rider out from the World Tour team but all three squads are still hunting for a stage win in part because a handful of teams have dominated the stage wins including Lampre-Merida who win their fourth stage thanks to Sacha Modolo who finished off the work done by his team mates in the finish, helped by drifting across the line to thwart Giocomo Nizzolo who now wears the red points jersey. “I’m not a champion”, Modolo said afterwards, “just a good racer”. The finish in Lugano showed that if the likes of Alberto Contador and Vincenzo Nibali have moved here for tax reasons there’s some good riding to be done too. The Route: a flat procession from Lake Lugano to Lake Maggiore. It all changes when the race flicks in land to climb Monte Ologno. It’s a good sized road but 10km at 9% make this a very tough climb especially as the steepest ramps come early to make it selective from the start. If that’s not enough the Mountains Prize point is not the top because after a short and twisty descent the race continues up to Alpe Segletta on a roller coaster road. The Finish: it’s downhill to the line, the road twists and turns on the descent but the closer to the finish it gets the road gets bigger and it’s not the most technical of descents, it’ll be hard to chase but it’s not necessarily the terrain for a descent daredevil, anyone away will need the power to sprint out of corners and keep the pace up. The final 5km are flat and interrupted by several roundabouts. The Contenders: given Lampre-Merida are collecting stage wins Diego Ulissi could get his second stage win if he can hang on up the climb as he has a fast finish but is better suited to uphill sprints. Carlos Betancur is a rider who can win a sprint from a small group and climbing better and better. Yuri Trofimov is a great descender but this might not be technical enough for him, team mate Ilnur Zakarin might prefer to take flight on the climb. Beñat Intxausti is still in the fight for the mountains jersey even if he hasn’t looked so good in the last few days and team mate Giovanni Visconti is well suited to a climb like this if the main GC riders avoid too much aggression. If things do go all out – it keeps happening – then Fabio Aru could finally get the better of Alberto Contador in the sprint to the line. TV: the climb of Monte Ologno will start around 3.40pm and the finish is for the earlier than usual time of 4.55 Euro time. As ever Cyclingfans and steephill.tv both have links to pirate feeds. The Giro is: doing ok on television. Just over two million Italians tuned in last weekend to see the stage finish in Madonna di Campiglio while six million watched the Formula 1 Grand Prix. It’s good but not stunning. By contrast the Tour de France can get six million on a good day among French viewers, and over 50% audience share too. The population sizes are similar, 59 million in Italy compared to 66 million in France. If it was uphill probably but in a downhill run? Maybe Astana need to engineer something for Aru, a confidence booster before the final two stages? It’s a mini Giro di Lombardia, Alpine and with climbing but with the look and feel of the one day classic. Pieter Weening might be another name to throw out there, a rider who can definitely win a mountain stage from a breakaway. He had a great Giro last year and I was wondering what he’d do this time but he’s not been so visible. If last year’s Weening was here then yes but today? Let’s see what he can do. Sacha Modolo was saying interesting things about the sprint train and the long way to get it right. The difference that makes you can see at Ettix-Quckstep and Cofidis. It still isn’t only about buying the fastest sprinter, it is about the team working together and for each other. I’d like to see Mick Rogers or Kreuziger take this stage win after working so hard for their team captain. Even Luca Paolini, who gave it a go yesterday, would be another fine winner today. Want about kruis wijk? He seems to be in the top, every time there are hills, en the race when the race is hard? It’s relevant because RCS offered quite a vague profile from the official Gpm on, as they’re starting to do more often than not on tricky stages – and I’m starting to suspect that’s on purpose (SDS is too meticulous a cartographer to imagine they’re just attention slips). As inrng says, Gpm is not the end. I’d especially point out the fact that, right after it, you’ve got a very short descent with a couple of hairpins, some two kms I think, than you’re climbing again and it’s not really something you can jump over in a breath: about 3 kms, the first is generally quite easy (+/- 6%), which could be dangerously deceitful, but then it rises to an average 10-11% until you’re on the top. It’s only then that the real “rollercoaster” starts, with a mild descent interrupted by a couple of very steep stretches (not longer than 200-300 mts. each). After this “experience”, when you run into the following steep sections, you could be induced to even excessive caution, whereas someone who knows exactly where they are and how long they last could well take advantage of them to build a small gap to be extended in the technical part of the descent and then defended to the line. Certainly looks like one of those roads where shifting the front chainrings is going to be done a few times…and with these huge gaps (34 to 50, 36 to 53, etc.) plenty of chances to drop the chain as it looked like happened to Il Pistolero today. How convenient the team car was right there? Contador didn’t even have to pull his feet out of the pedals before the mechanic was pushing him! I was wondering why that car was allowed in there with + or – a minute between Contador and the Aru group, especially with neutral cars and motos on the course? Perhaps it’s just things balancing out after Pistolero’s earlier problems? In any case, he’s looking too strong for anyone to do much, which seemed to be acknowledged by Beppe Martinelli after the stage. I hope they keep trying though, it’s NEVER over until it’s over…and Contador could use a stage win too. Given the difficulty of the stages ahead on Friday and Saturday, but particularly the 235km slog on Friday, I think Astana and Tinkoff should keep their powder dry today and let a break go. Betancur to take it. Really warming to him as a rider. So much talent. I would say the same, but this Giro has been so surprisefull till now that I don’t discard embushes. The stage profile is very adapted to it, and the explanation of Gabriele on the post GPM part tends to confirm it. @inrng, there’s a significant error about TV audience, even if the comparisons you suggest still make sense. Those data *don’t* include Rai Sport 1, but just Rai 3, the generalist channel. Both on Saturday and on Sunday, as well as on Tuesday (which is quite notable, being it a working day) the Giro summed a total of 2.7 millions with a share of about 20-22%. Rai Sport 1 got some 700k spectators (with a forseeable slight shift on Tuesday, where you have 1.8M spectators on Rai 3 and 900k on Rai Sport 1), which is quite notable for a thematic channel, and definitely not something you wouldn’t take into account. Note the typical attitude of Italian media, including F1 data from different sources and ignoring the most obvious one for the Giro. – the steady 2.7M result is quite impressive because of three different reasons… on Saturday it was an ITT (! ), not exactly the most appealing show for generalist spectators; on Sunday you had the Monaco GP competition hindering the audience result; Tuesday is a working day (!). No doubt the Tour is way bigger and having a greater impact, but imagine that, for example, the two ITT during the Tour to which inrng is referring had TV results very similar to the Giro’s one (one was slightly under, the other slightly above) – both were held in working days. The Tour was able to hit the 6M mark only on a very special day, not only a decisive stage but also a quite peculiar one, the Ventoux finish. It barely hit the 5M in other decisive mountain stages (the best was 5.3M on the Alpe d’Huez). The Tour base-line is around 3M spectators, while the Giro one is around 2M, which would make it about the 73% of the Tour in terms of national audience (the huge difference is on the global market); but when we speak of peaks the Giro suddendly shrinks to a 55-60%. I’d say, at first sight, that the Tour audience is more fluctuating, reflecting a greater relative interest by the (often-but-not-always more valuable) generalist public, surely because of the vacation effect and thanks to an immensely heavier marketing machine. Imagine that both RAI and RCS, who are the “owners” of the product, make very little effort to promote it outside the limited boundaries of yet-interested fans (you hardly spot an ad on generalist channels, spare and rare references in the news, no front page before the Giro starts, and only from time to time when it’s on – compare that with L’Equipe o__O) . And I’dd add that the impact of having 2M (Giro) or 3M (Tour) watching 2 hours of racing and ads *every day* along *three weeks* is huge in marketing terms. I simply can’t erase from my mind a good number of new and old Giro ads, no matter how hard I try and the ad-blocker my brain has installed by default. Inrng if you ever want to take a vacation from all of this. I vote you have Gabriele sub. About the audience, RAI is doing well. Between 200.000 and 500.000 more total viewers every day than 2014. Also the share/rating is better than 2014 ( except last weekend but last year Serie A was already over ) and it keep growing ever year. On contrary they never had an high peak of viewers like Val Di Fassa 2011, Stelvio 2012 , 3 Cime 2013. We’ll see last weekend but the choice of having Mortirolo stage on tuesday wasn’t probably the best one. AC dishing out a big serving of Payback Time, just the sort of thing that makes cycling such a great sport to follow. A favour earns a favour and vice versa. LOL, what goes around comes around. What’s peculiar about the Astana attempt was that they didn’t even manage to take anytime out of AC. But they may just have provoked AC into wasting energy and his reserve for the Tour. That chasing back and today’s attack must have costed him. But he can – if he wants – cruise through the next two – otherwise very difficult – stages. Exactly, just follow wheels and enjoy, he deserves it.